When government agencies refuse to let the members of the public watch what they’re doing, drones can be a crucial journalistic tool. But now, some members of Congress want to give the federal government the power to destroy private drones it deems to be an undefined “threat.” Even worse, they’re trying to slip this new, expanded power into unrelated, must-pass legislation without a full public hearing. Worst of all, the power to shoot these drones down will be given to agencies notorious for their absence of transparency, denying access to journalists, and lack of oversight. Back in June, the Senate Homeland Security and Governmental Affairs Committee held a hearing on the Preventing Emerging Threats Act of 2018 (S. 2836), which would give the Department of Homeland Security and the Department of Justice the sweeping new authority to counter privately owned drones. Congress shouldn’t grant DHS and DOJ such broad, vague authorities that allow them to sidestep current surveillance law. Now, Chairman Ron Johnson is working to include language similar to this bill in the National Defense Authorization Act (NDAA). EFF is opposed to this idea, for many reasons. The NDAA is a complicated and complex annual bill to reauthorize military programs and is wholly unrelated to both DHS and DOJ. Hiding language in unrelated bills is rarely a good way to make public policy, especially when the whole Congress hasn’t had a chance to vet the policy. But most importantly, expanding the agencies’ authorities without requiring that they follow the Wiretap Act, Electronic Communications Privacy Act, and the Computer Fraud and Abuse Act raises large First and Fourth Amendment concerns that must be addressed. Drones are a powerful tool for journalism and transparency. Today, the Department of Homeland Security routinely denies reporters access to detention centers along the southwest border. On the rare occasions DHS does allow entry, the visitors are not permitted to take photos or record video. Without other ways to report on these activities, drones have provided crucial documentation of the facilities being constructed to hold children. Congress should think twice before granting the DHS the authority to shoot drones down, especially without appropriate oversight and limitations. If S. 2836 is rolled into the NDAA, it would give DHS the ability to “track,” “disrupt,” “control,” “seize or otherwise confiscate” any drone that the government deems to be a “threat,” without a warrant or due process. DHS and DOJ might interpret this vague and overbroad language to include the power to stop journalists from using drones to document government malfeasance at these controversial children’s detention facilities. As we said before, the government may have legitimate reasons for engaging drones that pose an actual, imminent, and narrowly defined “threat.” Currently, the Department of Defense already has the authority to take down drones, but only in much more narrowly circumscribed areas directly related to enumerated defense missions. DHS and DOJ have not made it clear why existing exigent circumstance authorities aren’t enough. But even if Congress agrees that DHS and DOJ need expanded authority, that authority must be carefully balanced so as not to curb people’s right to use drones for journalism, free expression, and other non-criminal purposes. EFF has been concerned about government misuse of drones for a long time. But drones also represent an important tool for journalism and activism in the face of a less-than-transparent government. 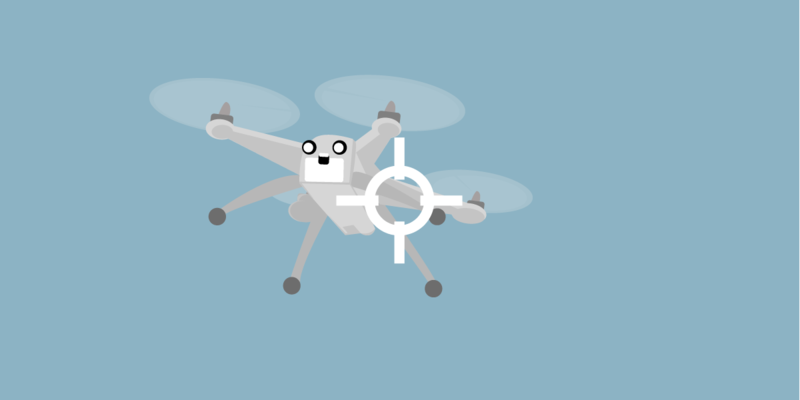 We can’t hand the unchecked power to destroy drones to agencies not known for self-restraint, and we certainly can’t let Congress give them that power through an opaque, backroom process.